Spring Training in Dilworth Park Starts Today! On Tuesdays, Wednesdays and Thursdays, come to Dilworth Park at City Hall for a variety of free programs, conducted by expert trainers in the field of personal fitness. Spring Training is presented by Rothman Institute with partners Optimal Sport Health Clubs and City Fit Girls. Visit DilworthPark.org/springtraining/ for information and weekly fitness tips from Rothman Institute. Push your physical limits with these total body workouts. Each week, meet up with top-notch Optimal Sport trainers who have their own high intensity approaches to whip you into shape. Lace-up your running shoes for a 3-5 mile trek through Center City. City Fit Girls is an all-levels running and fitness community for women and meets at Dilworth Park near the information center. Zumba gets your body going with a calorie-burning dance party set to Latin and pop music hits (powered by Live Nation), led by instructors from Optimal Sport. Door 19: "Off the Hook"
The Air Grille at Dilworth Park is Open! Dine al fresco at Dilworth Park while enjoying the seasonal menu at Air Grille. 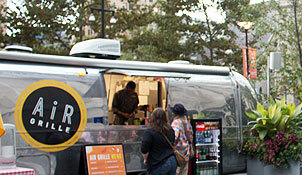 This classic silver Airstream located directly adjacent to the Dilworth Park Café, offers American fare, including a delicious Air Grille Cheesesteak, California Chicken Wrap, Shrimp Dumplings and more. The chefs at Brûlée Catering created the seasonal menu featuring locally sourced ingredients. Follow @AirGrille_PHL on Instagram and Twitter to stay up to date. Game On at The Franklin Institute! Showcasing the work of over 30 innovative game designers, the Game Masters exhibition takes visitors on an interactive journey inside their favorite video games—from the trailblazing arcade era through today's web and console games. Challenge yourself to a high score on more than 100 playable games as you learn how beloved characters came to life, and follow the remarkable transformations that video games have undergone over time. Visitors will have the unique opportunity to play in spectacular multi-player immersive experiences as well as on classic arcade games from the 1970s and '80s. On April 6 at 6pm, the Philadelphia Theatre Company will host its exciting new fundraising event: PTC's Play Brawl! Philadelphia celebrities and business leaders will face off on stage at the Suzanne Roberts Theatre in a friendly competition. Contenders will team up with local professional actors to recreate iconic scenes from stage and screen. Contenders include: David L. Cohen, Senior Executive Vice President and Chief Diversity Officer of Comcast Corporation; John Fry, President of Drexel University; Judith M. von Seldeneck, Founder and Chairman of Diversified Search; Molly D. Shepard, MS, MSM, President & CEO of The Leader's Edge/Leaders By Design; and more surprise contenders to be announced soon! Hosted by Jessica Dean of CBS 3. Take Transit Philadelphia's great transit system and pedestrian-friendly streets make car-free travel, shopping and dining easy in Center City! Get information on routes, fares, schedules and more, at SEPTA.org or RidePATCO.org.